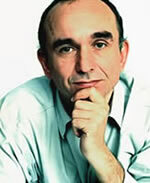 Peter Molyneux is one of the best-known names in the international world of computer games. He co-founded Bullfrog Productions in 1987 and created a new genre of computer games, the god game with the release of Populous. Since then Peter has been responsible for a string of massive selling games including Powermonger, Theme Park, Magic Carpet and Dungeon Keeper. Cumulative sales of his games are now approaching the ten million mark worldwide. In 1997 Peter left Bullfrog Productions to form a new games development company Lionhead Studios. The company has released two games Black & White in 2001 and Fable in 2004, cumulative sales are already over 3 million copies. Autumn 2005 saw the release of Black & White 2 (PC), The Movies (PC) and Fable: The Lost Chapters (PC and Xbox) Lionhead now numbers over 200 employees and is working on four new games. Peter is recognized as one of the computer games industrys most articulate and eloquent speakers on the subject of the development of computer games. He has recently received an honorary doctorate from the University of Abertay and was inducted into the Academy of Interactive Arts and Sciences Hall of Fame. Peter was also awarded an OBE in the 2005 New Years Honours List for services to the computer video games industry.